Acai is a rich source of anthocyanins and other phenolics and phyto-nutrients. Acai berries are amongst the most nutritious foods of the Amazon, rich in B vitamins, minerals, fibre, protein and omega-3 fatty acids. Acai also contain oleic acid (omega-9), a beneficial fatty acid also found in olive oil. 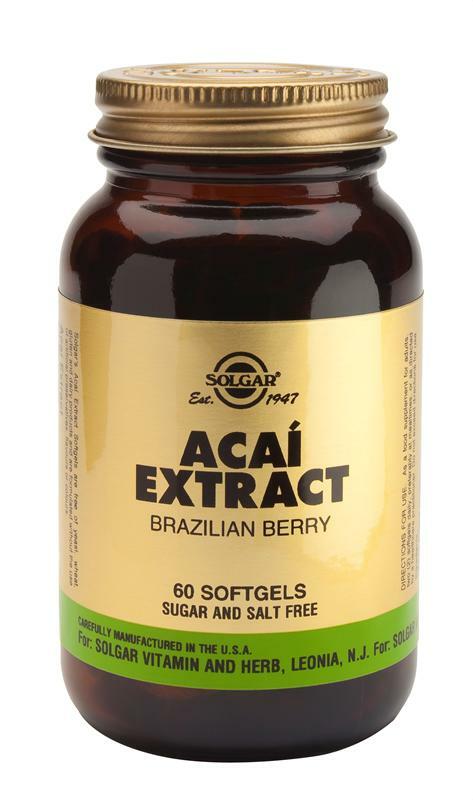 As a food supplement for adults, two (2) Solgar Acai Extract softgels daily, preferably at mealtimes, or as directed by a healthcare practitioner. Do not exceed directions for use. Solgar's Acai Extract Soft gels are free of yeast, wheat, gluten and dairy products and are formulated without the use of artificial preservatives or flavours. New research discovered the powerful benefits of another fruit that grows wild in the Brazilian Rainforest. Acai (pronounced ah-sigh-ee) is an antioxidant rich dark purple berry which has been used by the indigenous people of Brazil for years. In fact, these Acai berries have been called nature’s most nutritious food. Only recently this special fruit has become available for the rest of the world too! Acai Berry: In Brazilian herbal medicine, the oil of the Acai fruit is used to treat diarrhoea; an infusion of the grated fruit rind is used as a topical wash for skin ulcers and the fruit seeds are crushed and prepared in an infusion for fevers. In the Peruvian Amazon, an infusion of the toasted crushed seeds is used for fever. In Colombia, where the trees grow along the Pacific coast line, it is called naidí and the fruit is turned into a common and popular drink. Acai Juice: Easily the most popular use of the Acai fruit by peoples inhabiting the Amazon Basin is the dark purple juice. The juice is extracted from the small round fruit by soaking the seeds in water to soften the thin outer shell and then squeezing and straining them to produce a very tasty, dense purple liquid. Acai liquid is served fresh and ice cold. Acai Health Benefits: What is known about the Acai berry fruit health benefits, backed by scientific research into the fruits properties, is quite substantial. Acai is a rich source of anthocyanins and other phenolics and phyto-nutrients. Acai berries are amongst the most nutritious foods of the Amazon, rich in B vitamins, minerals, fibre, protein and omega-3 fatty acids. Acai also contain oleic acid (omega-9), a beneficial fatty acid also found in olive oil. Minerals found in Acai Berry: Potassium is the mineral most abundant in the Acai, but it is also rich in copper, and unusually high in manganese. Acai Phytonutrients: Anthocyanins are compounds that have potent antioxidant activity. The famous research regarding the "French Paradox" attributes anthocyanins as being the antioxidant that protects the French from heart disease. The French are known to consume large amounts of coffee, nicotine, sugar, white flour and cheese and yet they have a very low rate of heart disease compared to neighbouring countries like the UK and Denmark. The red wine grape, due to its anthocyanins is what is believed to be responsible for the very low incidence of heart disease. While red wine has good quantities of anthocyanins, the Acai berry has been shown to contain up to 30 times the anthocyanins levels of red wine. By neutralising these free radicals, anthocyanins from the Acai berry may actually serve to maintain the healthy function of numerous systems and organs. Some of the anthocyanins that have been found in Acai include cyanidin-3-glucoside and cyanidin-3-glucoside-coumarate. Other phenolics include catechin and epi-catechin (the same compounds in green tea), quercetin derivatives and other flavonoids. It is likely that the synergistic effects of these compounds, as present in Acai fruit are responsible for its potent antioxidant activities. ORAC Scale: The Oxygen Radical Absorption Capacity (ORAC) assay measures the total antioxidant activity of a biological sample. It’s a test developed for the USDA by scientists at Tufts University to measure the antioxidant speed and power of foods and supplements. The ORAC scale is used in human, agricultural, food and pharmaceutical products, as well as food ingredients and is quickly becoming the accepted standard for comparing antioxidant potential in foods and supplements. Acai Antioxidant Benefits: For the average person to cope with all the reactive oxygen species they will encounter, foods and beverages totalling an ORAC value of about 1,670 per day are needed. It’s been estimated that 80-90 percent of the world’s population fails to consume even half of this level. At 3,800 ORAC value per gram, Acai is reputed to be extremely high on the ORAC scale and provides levels multiple times that of other anthocyanin-rich fruits and vegetables, such as cherries, cranberries and mulberries. Ageing Population: As the population ages, 80% of older people in Western countries will develop at least one chronic metabolic disease. If the USDA says that high-ORAC foods may slow ageing and prevent metabolic disease from occurring, it's very wise to increase the amount of high ORAC foods in the diet to prevent this process from occurring in the first place.